Some of the following Consumer Action publications are available in bulk for non-profit or government agencies to distribute for educational purposes. Further info can be found on the How To Order Consumer Action's Publications page. 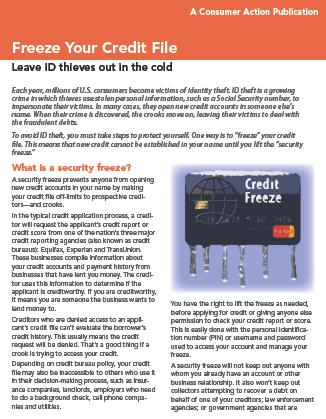 A credit file “security freeze” is a preventive tool to help you avoid identity theft and to block impostors from using your personal information to establish credit. This publication explains how to “freeze” your credit file, which prevents new credit from being established in your name until you temporarily or permanently lift the freeze. Scammers cheat unsuspecting consumers out of millions of dollars each year, but there are ways to avoid becoming a scammer’s next victim. This guide will help consumers understand how crooks reel in their prey, recognize and evade scam attempts, and learn about scam prevention and reporting resources. 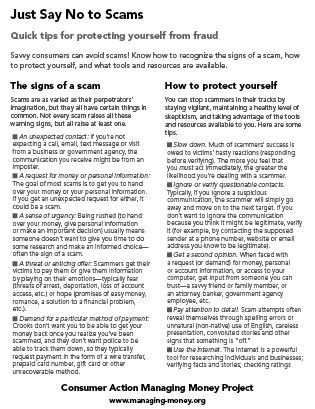 The Just Say No to Scams “quick tips” sheet provides consumers with the basics of recognizing the signs of a scam, understanding how to protect themselves and knowing where they can learn more. Formatted as a two-sided black-and-white publication, the tip sheet is easy and economical for community educators to print and distribute. 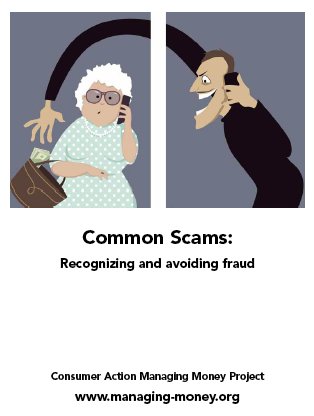 This compendium of widely perpetrated scams provides details about how common scams are carried out, how consumers can avoid them, and where to report different types of scam attempts. 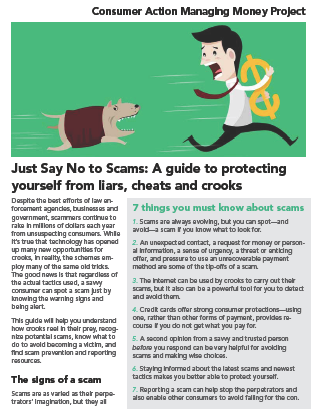 It is intended for use with the “Just Say No to Scams” consumer guide. This downloadable packet guides community educators through a two-hour presentation on recognizing and avoiding scams. In addition to the lesson plan (to be used in conjunction with the downloadable PowerPoint presentation), the packet includes exercises, resources and a class evaluation form. 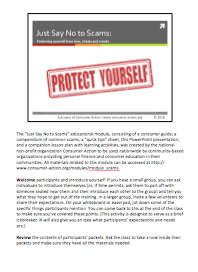 This downloadable PowerPoint presentation is designed to be used in conjunction with the “Just Say No to Scams’” lesson plan. The slides provide a visual component to the training that helps to engage learners and improve retention. According to AARP, older people who fall for scams tend to believe the pitches they hear. Many believe they have a good chance of actually winning a prize or that the products they see advertised are worth the price. This manual is written in question and answer format to allow you to quickly find the answers to questions about the myriad scams that target seniors. This backgrounder is written in question-and-answer format to supplement the information in the companion brochure. 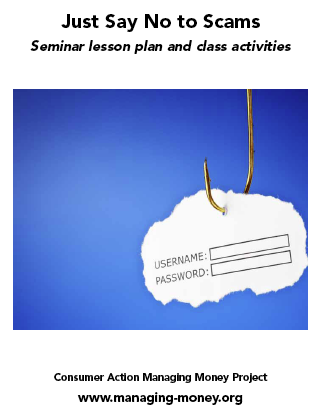 The Preventing Senior Scams PowerPoint training file is available for download in the “Download File” section. Everyone must be on guard against scams, but seniors can sometimes be more vulnerable to fraud. 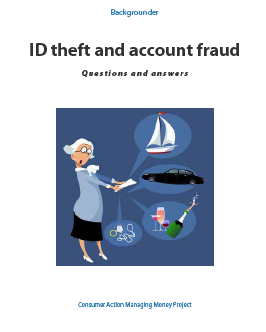 This brochure outlines the many guises of fraud, with special attention to scams that target seniors. Signs of fraud and tips for avoiding scams are included.